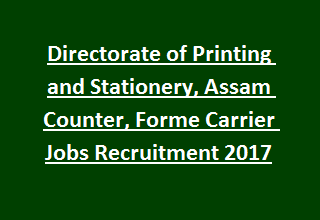 Printing & Stationery, Assam Recruitment Notification 2017: Directorate of Printing and Stationery, Assam inviting application forms from the Indian Citizens for filling up 36 Counter, Forme Carrier vacancies. Total available vacancies in Printing and Stationery, Assam Recruitment are 36 posts. Candidates eligible for this current recruitment are advised to send the application before 15th November-2017. Fill the required fields in the application form with candidate own handwriting. Candidate age should be between 18 years to 43 years as on 01-01-2017. Upper age will be relaxed by 05 years for SC/ ST candidates. Pay scale for Counter and Forme Carrier Jobs is Rs. 14,000/- to Rs. 49000/- plus Grade Pay of Rs. 5,600/- and other allowances. Application with attested qualification, Age, Caste related certificates must be addressed to ‘Directorate of Printing & Stationery, Assam, Guwahati- 21’. 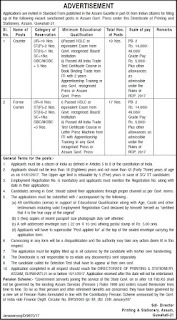 More details of Directorate of Printing and Stationery, Assam Recruitment of 36 Counter, Forme Carrier vacancies important dates, application procedure, Selection process, Age limit & relaxations, Pay Scale and other information are given below. 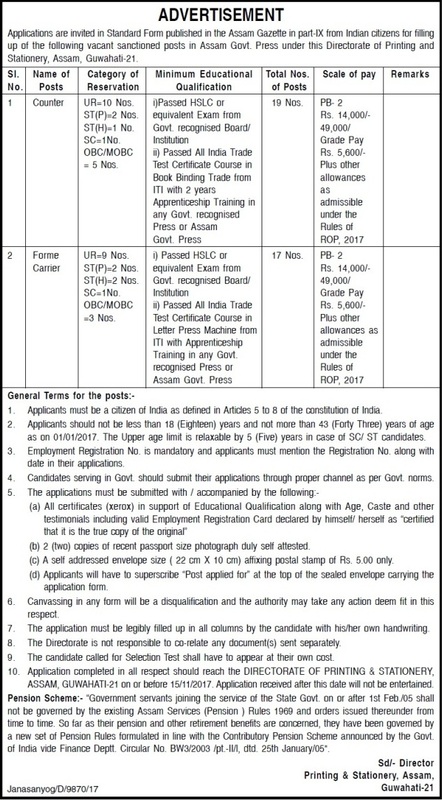 Available vacancies in Directorate of Printing and Stationery, Assam Recruitment are 36 posts. Total no of vacancies: 36 posts. Counter: Must have passed HSLC or its equivalent qualification from govt recognized Board and All India Trade Certificate Course in the trade of Book Binding from ITI with two years Apprenticeship Training in Assam Recognized Press or Any Govt Recognized Press. Forme Carrier: Must have passed HSLC or its equivalent qualification from govt recognized Board and All India Trade Certificate Course in Letter Press Machine from ITI with Apprenticeship Training in Assam Recognized Press or Any Govt Recognized Press. Age of the candidates should not be less than 18 years and not more than 43 years as on 01-01-2017. Upper age limit will be relaxed by 05 years for SC/ ST candidates. Pay scale for this recruitment is Rs. 14,000/- to Rs. 49000/- plus Grade Pay of Rs. 5,600/- and other allowances admissible as per rules. Candidates applying for Counter and Forme Carrier Jobs in Assam Printing and Stationery Recruitment will be shortlisted based on selection test. Details of Selection test are available in the notification. Candidate with eligible qualifications must fill all columns in the application with their own handwriting. Submit the application with the attested copies of Educational Qualifications, Age, Caste certificates and 2 copies of recent passport size photographs to the following address before 15-11-2017.